Sybil Franklin needs a husband â€“ fast! In order to keep the ranch she inherited from a father she never knew, she must be married within thirteen days. One man comes highly recommended. The problem is, he has no interest in marriage, no matter what she offers in return. Devin McGregor had a ranch once, had a fiancÃ©, had a future. He made a mistake, and it cost him everything. Now, heâ€™s afraid to risk failing again, even though itâ€™s tempting to accept Sybilâ€™s marriage proposal. When Sybil decides to post an advertisement for the perfect husband, Devin knows he has to stop her from being taken advantage of, but thereâ€™s only one way to do that â€“ marry her himself. If Devin canâ€™t overcome his fear of failure, heâ€™s going to lose everything again â€“ including the woman he loves. Chapter 1Â Â Â Â Â It was time. Â Â Â Â Â Sybil Franklin opened the bedroom door and stepped inside for the first time since her motherâ€™s death. Â Â Â Â Â She closed the door behind her and leaned her back against it, letting the memories wash over her. She breathed in the familiar lavender scent, feeling her motherâ€™s presence in the room sheâ€™d never left for more than four years before she died. Â Â Â Â Â A layer of dust covered the surface of the fluted walnut dresser on the wall near the window and the night tables flanking the heavy four-poster bed that dominated the space. Â Â Â Â Â Sybilâ€™s footsteps were muffled as she trudged across the carpet and gathered up the hand-knitted pink lap blanket from the rocking chair in the corner. She held it close to her chest as tears stung her eyes and rolled unheeded down her cheeks. Â Â Â Â Â She glanced at the small clock on her motherâ€™s dressing table. It had stopped weeks ago, but she didnâ€™t need to see the time to know it was late afternoon. Â Â Â Â Â Raindrops pattered against the window looking out onto the street, but life didnâ€™t stop, even for bad weather. Outside, carriages rolled by. People talked to each other as they passed the window. Children played. Â Â Â Â Â Sybilâ€™s tears dripped onto the blanket clutched in her hands, but she let them fall until she was spent. Then, taking a few shuddery breaths, she folded it and placed it on the bed. Â Â Â Â Â Sheâ€™d had to give herself a stern talking-to to get her to the point of dealing with her motherâ€™s belongings, and unpleasant as she knew it would be, it had to be done eventually, and putting it off wouldnâ€™t make the job any easier. Â Â Â Â Â For the next hour, she carefully folded and piled the dresses and winter coat still hanging in the wardrobe, and the blouses and shawls in the dresser drawers. Tomorrow, sheâ€™d take the clothes and her motherâ€™s shoes and boots to the church to donate to those less fortunate than herself. Â Â Â Â Â Sheâ€™d already kept a few personal items for herself â€“ a music box that held the few pieces of jewelry her mother had owned, a magnifying glass her mother had used to read her precious books, a mother-of-pearl letter opener. Â Â Â Â Â Finally, all that was left was a small trunk in the bottom of the wardrobe in the corner of the bedroom. Â Â Â Â Â Crouching down, she wrapped her fingers around the iron handle on the side of the trunk and dragged it out of the wardrobe. Â Â Â Â Â The trunk had been beautiful once, but now, the wood was weathered, the two leather straps wrapped around it cracked and dry. The lock was rusty, and the brass studs that decorated the lid were now almost obscured by a layer of dust as if it hadnâ€™t been opened in months. Â Â Â Â Â Sybil had never seen the inside of the trunk. Sheâ€™d asked her mother about it a few times over the years, and each time, sheâ€™d been told the contents were private and none of her business. Her mother had kept the trunk locked, and Sybil had never known where the key was hidden. Â Â Â Â Â A memory suddenly surfaced in her brain. Once, when she was a girl and her mother had been outside working in the small vegetable garden behind the house, sheâ€™d taken a kitchen knife and gone into her motherâ€™s bedroom. Sheâ€™d opened the wardrobe, climbed inside and pulled the door shut, intending to pry the lock open. She hadnâ€™t been there long when the door suddenly opened, bright light spilling in. Sheâ€™d looked up to see her mother, hands planted on her hips, her eyes narrowed, her lips pressed together in anger. Sybil had learned very quickly â€“ and harshly â€“ that she was never to touch the trunk again. Â Â Â Â Â What secrets did her mother have that she was so afraid of being discovered? Â Â Â Â Â Even now, a feeling of guilt swelled inside Sybil as she held the brass key in her hand and prepared to open the trunk. Sheâ€™d found the key hidden in the pages of a copy of Pride and Prejudice in her motherâ€™s dressing table. It had fallen out when sheâ€™d picked up the book, intending to put it back on the shelf in the parlor. Â Â Â Â Â Her heart raced, and a chill washed over her. Â Â Â Â Â She sensed her mother looking down from above, a stern expression of disapproval on her face. With trembling fingers, she unbuckled the leather straps, then inserted the key into the brass lock and turned it. A moment later, she heard a slight click and the hasp sprang open. Â Â Â Â Â Taking in a steadying breath, she lifted the lid. Stale air met her nose as she looked inside. Â Â Â Â Â A dried flower. A yellowed ticket stub from a theater performance. A plain gold wedding band engraved with the words â€œforever mineâ€. Â Â Â Â Â But it was the stack of yellowed envelopes tied with a blue ribbon that drew Sybilâ€™s attention. Perhaps letters from her father to her mother before they married? Â Â Â Â Â Sybil had never known her father. Heâ€™d perished in a fire when she was a baby. 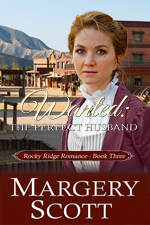 Â Â Â Â Â She picked up the letters, taking note of the return address â€“ Rocky Ridge, Colorado. Her brow furrowed. Surely if her father had spent time in Colorado, her mother would have mentioned it at one time or another. Â Â Â Â Â Her curiosity piqued, Sybil untied the ribbon, intending to read only the letter on top of the pile. Somehow, the letters slipped out of her grasp and slid to the polished hardwood floor. It was then the beginning of her name on one of the envelopes caught her eye. Â Â Â Â Â Her heart thudded behind her ribs as she plucked it out from beneath the others. The letter was addressed to her, and came from an attorney in Rocky Ridge. Â Â Â Â Â The envelope had been opened, yet sheâ€™d never seen it before. Why had her mother hidden it from her? Â Â Â Â Â With trembling fingers, she opened the flap and took out a single piece of paper. Â Â Â Â Â Â Â Â Â Â It is with deep regret that I must notify you of the death of your father,Â Mr. Harvey Franklin. Â Â Â Â Â Â Â Â Â Â yourself to my office within one year of the date of this letter to claim the said estate. Â Â Â Â Â Â Â Â Â Â Failure to do so will result in forfeiture of all claims against the estate. Â Â Â Â Â Â Â Â Â Â Please contact me as soon as possible to make arrangements. Â Â Â Â Â The letter in her hand was dated almost ten months before. Â Â Â Â Â Sybilâ€™s heartbeat stuttered. The room swam, and she slumped to the floor, her back flat against the wall. She couldnâ€™t wrap her mind around the fact that her mother had lied to her. Her whole life, sheâ€™d believed her father had died when she was an infant, when in reality, heâ€™d been alive and well until less than a year ago. Â Â Â Â Â Her mind in a whirl, the letter slipped from her fingers and fluttered to the floor. Her gaze shifted to the rest of the pile. She flipped through the other letters absently, her mind not really registering what she was seeing. There were at least twenty letters in the pile, all addressed to her mother in the same handwriting, the postmarks dated every few months from the time she was less than a year old until his last letter a month before his death.